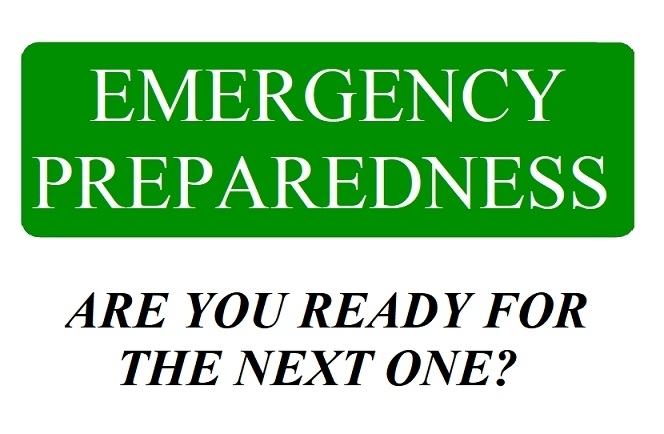 Are you prepared for and emergency? Do you have a 3 day supply of emergency food and water on hand? Do you have supplies for a week? Two Weeks? Utah State University (USU) recommends one gallon of water per person, per day, for drinking and hygiene. If you live in a hot arid area like we do, you should store more water per person, per day. And don't forget food and water for your household pets and/or livestock! The home canner has a wonderful resource at her/his fingertips: home canning experience and skills. A home canner can preserve food at home by pressure and boiling-water bath canning and dehydration to store in an emergency. If home preserved in glass jars these supplies would be specifically stored in a place to minimize jar breakage and maximize access during the emergency. You can keep three day food/water kits in your home or car trunks, to be rotated in and out of service at regular intervals. A home canner can also preserve water. Water, as it comes from a municipal supply, is good to store in food-safe gallon jugs (page 1), according to USU; just fill from the tap and screw on the lids. To increase safety for longer term storage, water may be heat treated in sealed jars as instructed in "Water: Storage and Emergency Use", page 2, from the USU. Sounds like a good use for all those quart jars so often see in thrift shops. The above is just a little information contained on the USU site "Food Storage". Please take a look and download their booklet "A Guide To Food Storage For Emergencies" for more information; just click on the picture of the booklet.